The cheery atmosphere is perfect for an Italian sweet and cafe latte. In Italy, Italians eat sweets every day: a brioche or biscotti with their cappuccino for breakfast and maybe an almond cookie with cheese and fruit following lunch or dinner. Cookies are just the light touch of sweet Italians like at almost any hour. If you are of Italian descent like me, you remember the array of dolce at your nonna’s table: amaretti cookies, sfogliatelle, farfaletti. Especially at Christmas time, she likely served panettone in the morning and made cannoli for Christmas Eve dinner. If you want to recapture these delightful tastes of your childhood, or if you just want to indulge in the best traditional Italian baked goods in the area, visit Dolce Sicilia in Wheat Ridge. Since 2005, the Italian bakery has been owned and operated by Francesco Spatola (Franco), a young Robert DiNiro lookalike with a soft-spoken voice and a tattoo of a Sicilian countryside on his muscular left arm. He’s hardly the stereotypical fat-bellied baker with a mustache across his face and toque on his head. Fit 40-year-old Spatola gets his muscle from kneading dough, which he starts doing every morning seven days a week at 3 a.m.
Spatola makes every bread, pastry, biscotti and cookie from scratch, using recipes from generations of his family who owned bakeries and restaurants in Marsala, Sicily (where Marsala wine is made). After moving from Marsala to America at age 18, he went to work for a family member who owned a bakery in Boston. While visiting relatives in Denver in 1990, he decided to stay. Here he worked for Costco as the bakery manager for 12 years. It was a good job, but he missed Italian baking and the creative process. He wanted to go back and do what he loved—baking Italian cookies and pastries. So with a loan and money saved, he bought a small coffee shop, turned it into a bakery and never looked back. Occasionally, his mom Michele or brother Michael will come in to help at the counter. But it’s Spatola operating the ovens . . .at 3 a.m.
That the bakery is in an area heavily populated by Italians certainly helps the business, but it doesn’t account for all the customers. Spatola supplies many restaurants like Cafe Giordano in Lakewood and Bella Bistro in Arvada with his famous Italian bread. Even Epicurean Catering is a regular customer. Besides pastries and bread, Dolce Sicilia serves breakfast and lunch. Spatola enjoys a steady clientele who come in for his Italian standards of pizza, calzones, meatball and sausage sandwiches, eggplant Parmigiana and lasagna—all for less than $10. His raspberry twist—puff pastry filled with raspberry filling, coconut flakes and walnuts—is a morning favorite. But more than anything, it’s the hard-to-find Italian sweet specialties Dolce Sicilia regulars pop in for at all times during the day. A constant stream of people came through the door while I was there, giggling over the goodies in the cases like kids in a candy store. Here’s the thing about Italian pastries: they are more chewy than gooey like other European pastries, and they aren’t as sugary sweet. Flavor is king. Almond, cinnamon, anise, fruit, ricotta cheese—these are the primary ingredients Spatola uses to capture the traditional tastes from Italy. Mezzaluna cookies — shaped like a half-moon, these crunchy cookies are half dipped in chocolate. Rainbow cookies — more like a small cake or petit four, the squares are three layers of almond flavored sponge cake colored like the Italian flag held together with raspberry and apricot filling and coated with a thin layer of chocolate. Cannoli — a crisp fried pastry shell filled with sweetened ricotta covered on the ends with chocolate bits or sliced pistachios; originally from Sicily. Panettone — a dome-shaped yeast cake made with dried and candied fruit; a specialty at Christmas. Tiramisu — a traditional Italian dessert made from rum-laced ladyfingers, espresso and mascarpone cream. Claudia Carbone originally wrote this piece for Colorado Expression Magazine. Claudia Carbone is an award-winning journalist and author who writes for a number of magazines and websites. A full-blooded Italian, she likes her panettone slathered with butter for breakfast or afternoon treat with cafe latte. Dolce Sicilia Italian Bakery is a TrueItalianTable recomended authentic Italian restaurant. Thanks very much for your comment. 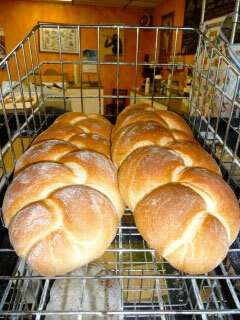 You may want to call Franco Spatola of Dolce Sicilia Italian Bakery, (303) 233-3755. I’m sure he can answer your question. By the way, I apologize for not responding sooner to your comment.